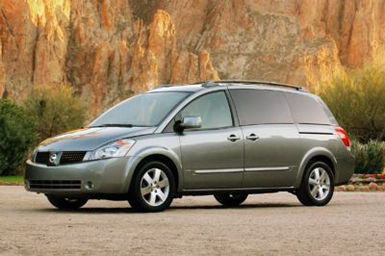 San Francisco: With the Quest, Nissan has applied its newfound flair for design to the common minivan. After 20 years, the minivan is becoming humdrum, even to soccer moms. And, there are many choices on the market, including the popular sport utility vehicles. Now we have the new Nissan Quest to add to the minivan mix. Knowing this, Nissan replaced their old, ordinary Quest with a brand new vehicle. This time, the Quest gets a lowered nose, for a more car like look and feel. The sides swoop up from the hood, while the rear panel leans forward, more like an old fashioned station wagon. Beveled edges and clean lines with strategically placed folds give the Quest a taut look filled with kinetic energy, ready to pounce. The face wears a slim, textured grille flanked by multi-lens lighting units that rise up dramatically to meet an arcing front pillar. It is all very unlike anything called a minivan before. Inside, the drama and excitement continue. The dash looks like it came out of a concept car. All gauges are mounted in a stylish binnacle in the middle of the front panel. Below it is certainly the most radical center console to be seen in America. More like a table, its working surface is resembles an obliquely sliced log, with the automatic shift lever on the left and the climate and entertainment knobs and buttons neatly arrayed to the right. The surfaces and materials are high tech, if perhaps a little subject to wear. Placement of the CD player, thanks to the angle of the consoles base, is hard to see, but the changer grabs CDs out of your hand without any undue fiddling. Nissan is proud that what once was a slightly smaller than normal minivan is now one of the biggest. It certainly feels spacious inside, as its got 44 cubic feet more room than its predecessor. And Nissan claims the widest opening sliding side doors in the market segment. The Quest comes with one engine, and its a good one, Nissans 3.5-liter V6. This engine has won the Wards Auto World 10 Best Engine awards for nine years in a row, and it is shared with Nissans other quite popular cars such as the 350Z, Maxima, Altima, and cousin Infiniti G35. With 240 horsepower and 242 lb.-ft. of torque, it sends the Quest along with assurance and poise. Fuel mileage is posted as 19 city, 26 highway; I averaged 19.7 over my commuting week. Transmission choices are a four-speed or a five-speed automatic, depending on model. Nissan offers three Quest models, dubbed S, SL, and SE, in ascending order. My SL tester, in Autumn Red, featured 16-inch alloy wheels. As an example of levels, the S has steel wheels and the SE gets 17-inch alloys. Also, the SL and SE have a power liftgate and the SL has a power right side sliding door. The SE has power sliding doors on both sides. With the S model, you do your own lifting and opening. Minivans are made for carrying families, so safety is a big priority. All Quests come with body crush zones and a sophisticated front passenger airbag that knows if theres a passenger sitting there. Side curtain airbags for all three rows are standard. Perhaps the best safety feature of all, though, is the cars quick reflexes, supported by four-wheel vented disk brakes with four channel antilock, brake assist, and electronic brake force distribution. The ABS helps prevent skids, brake assist makes sure you get maximum braking when you need it, and electronic brake force distribution makes sure the stopping power goes where its needed, automatically. Sometimes you need to haul something substantial. The Quests second and third row seats fold flat into the floor, so if you happen to spot a table and chairs at a garage sale one Saturday morning on your way to Starbucks, you can just flop down the seats and load up the bargains. If your cargo happens to be a weeks worth of groceries for a family then the built in bag hooks on the seat backs really help keep them from rolling around on the way home. You can get a Quest 3.5 S starting at $24,240. Even that starting model has a tire pressure monitor, an eight-speaker AM/FM/CD audio system, and an information center in the dash. The SL starts at $26,740 and the SE, at the top of the order, begins at $32,240. My SL tester had some desirable extras, including a DVD entertainment center with wireless headphones for the rear passengers ($1,500), a seat upgrade ($350), Nissans navigation system with CD in-dash changer ($2,300), and the 3.5 SL Upgrade Package, with front side-impact airbags, heated front seats and rear sonar system ($750). The bottom line was $32,330.